Bill Downs first arrived in Russia to cover the Eastern Front on December 25, 1942. He and other foreign correspondents were taken to Stalingrad just days after the German surrender there in February 1943. 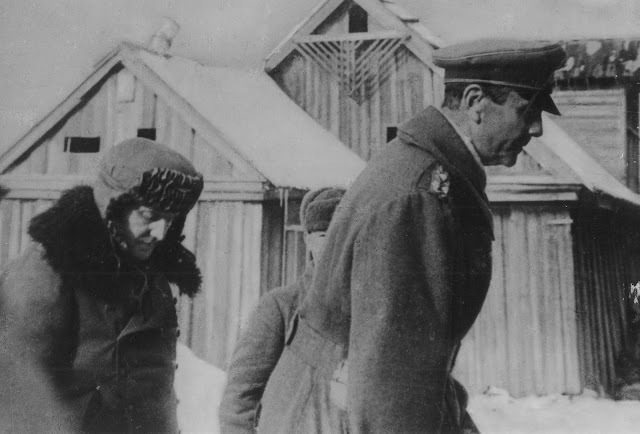 During their long journey the group came across the broken, humiliated Axis commanders in Soviet captivity, including Field Marshal Friedrich Paulus, whose 6th Army had just been destroyed. 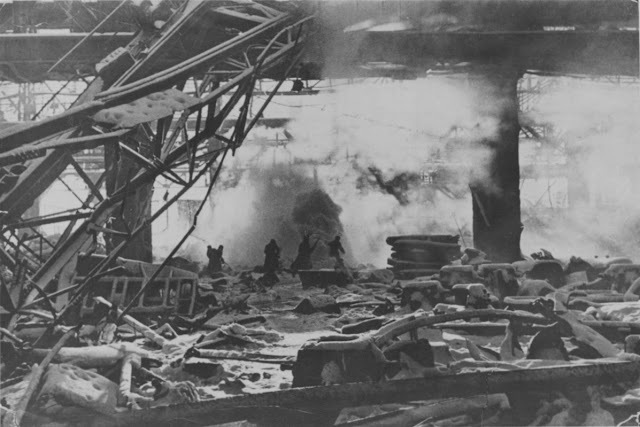 The press group then entered the city, where they passed bodies strewn along the streets and came across the wreckage at Mamayev Kurgan, the site of some of the worst fighting of the Battle of Stalingrad. Recalling the experience in a broadcast, Downs said: "There are sights and sounds and smells in and around Stalingrad that make you want to weep, and make you want to shout and make you just plain sick to your stomach." This text has been adapted from a transcript cabled to CBS in New York. The passages in parentheses were censored by Soviet officials for military security or propaganda reasons. The Foreign Office press department summoned the foreign press corps with a mysterious 6 p.m. phone call. They informed us we were leaving for Stalingrad at 8 a.m. the next morning. The trip was extremely hush-hush, although it had been announced that fighting had ceased in Stalingrad the day before. We were warned to dress warmly and take five days' worth of food. I rushed back to the hotel and collected hard boiled eggs, a slab of smoked fish, sugar, two loaves of bread, and most important of all, a liter of vodka, which is Russia's most important personal antifreeze. The next morning I dressed with three pairs of wool socks under fur boots, two pairs of wool underwear, a wool shirt, two sweaters, a ski jacket, a fur hat, and a fur coat—and I was among the lightest dressed in the party. Someone told me it was a mild winter. The five hour plane trip in a comfortable Douglas transport was spent recalling hundreds of stories of Stalingrad's four and a half months of concentrated hell, which was worse than Coventry's, Rotterdam's, Warsaw's, or London's—anything Hitler had been able to do to cities opposing him. The Douglas landed at an obscure little airfield 50 miles north of Stalingrad on steppes which looked like the Texas panhandle or Dakota plains buttered with about three feet of snow. The biting northwest wind of the Kalmyk Steppe made me look down at my legs to see whether I was not wearing a bathing suit. 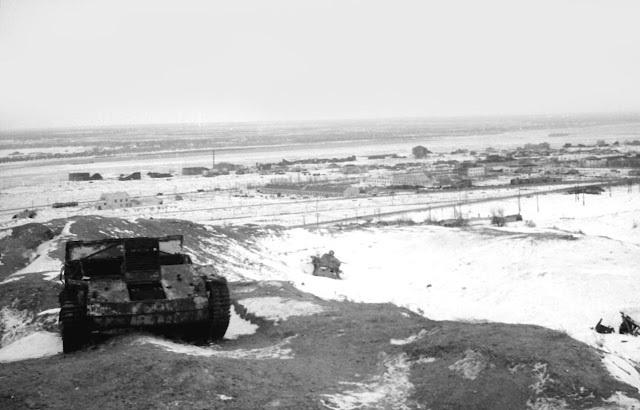 The airfield was a former fighter-bomber base located in the area where the northern arm of the Red Army's tremendous encirclement of west Stalingrad started. We sheltered in a group of a half dozen peasant farmhouses which formed a tractor station for the surrounding wheat country. We wondered how in the hell the Russians were able to concentrate an offensive army in these treeless, hill-less steppes without German reconnaissance discovering their striking power. That's mystery number one—or mistake number one—which was one of the major factors for the German defeat at Stalingrad. At nightfall we headed southward to another peasant farm village where we were liberally fed and tried to warm our freezing hands and feet, to the amusement of Red Army men and women who were interested in foreigners. We traveled by bus some 60 miles to a point 35 miles directly west of Stalingrad, where the next day we were taken to the headquarters of the commander of the Stalingrad front, Colonel General Konstantin Rokossovsky, who now takes a place as one of the great generals of history. Rokossovsky passed us en route to Moscow, where he went to the Kremlin to be awarded the Order of Suvorov for Stalingrad. We herded into a small peasant house where chairs were lined up like in a classroom, with desks in the corner and a map on the wall. In walked a medium-sized Red Army general, his breast lined with several medals, dressed in a simple uniform on which the Red Army's new epaulets had yet to be sewn. He is Lieutenant General Mikhail Malinin, chief of staff for the Stalingrad front and one of the men responsible for putting into operation plans for the encirclement of the German 6th Army. Malinin looked 35, square-faced with hair in a short pompadour which stuck up like a schoolboy's. The only sign of age was the sprinkling of gray hairs around the temples. He picked up a stick with which to point to the map. He looked as out of place standing at the front of that schoolroom as a schoolteacher would have looked in a front-line Stalingrad trench. Malinin started speaking slowly and deliberately and explained that he wanted to outline briefly the details of the Red Army's encirclement movement where it started. "Hitler sent his best troops—the German 6th Army—against Stalingrad, containing his crack infantry, tank, and motorized divisions," he said. Continuing in the same matter-of-fact tone, he said that as German forces moved toward the Volga, they created for themselves a sort of second front on the northern flank, "and the task of the defenders was not to give up the city." Malinin has been in three wars—in addition to the Russian Civil War and the Finnish War, he fought on the Moscow and Smolensk fronts in this war. He formerly was on the faculty of a Red Army military school. Malinin said "the German High Command apparently was unconcerned because they evidently planned to bring up a powerful groups of reinforcements from Kotelnikovo anyway. However, the genius of this plan directed by Joseph Stalin foresaw this and even predicted that the Germans would attempt to relieve the group. Thus the Red Army prepared for it. The Germans did just what we thought they would do. They were engaged and routed at Kotelnikovo. We captured the original Paulus order to commanders not to receive Red Army emissaries who advanced under white flag to present an ultimatum. This order specified that this peace delegation was to be fired upon—the exact translation read 'to see emissaries off the premises with fire.'" Malinin said that American and British equipment played very little part in the Battle of Stalingrad. "We had a small number of British tanks—Churchill tanks—but not enough to take into consideration when reckoning the entire offensive. Where they were used, they stood up well under test. No American tanks or planes were used in the battle. There were some American Dodge trucks, but they don't shoot." The interviews ended and we filed out of headquarters feeling like we had just taken a college examination for a master's degree in history. However, the Red Army moves fast, and they took us to a nearby village with a dozen or so scattered unpainted houses around which they posted heavy guard. The conducting Red Army colonel motioned us inside one house. There we found four German generals sitting around a table looking at each other, one in a sweater and the other three in full regalia. In the next room were four others standing and looking out the window, and sitting in the corner looking despondent was woebegone General [Romulus] Dimitriu, the onetime glorified Romanian general. The Germans in the first room got politely to their feet, smiling sheepishly. These men were Hitler's super-generals, leading super-Aryans against an inferior tribe. The only sign of their "super-ness" now were the magnificent decorations of iron crosses displayed on their uniforms like pictures on a gallery wall. The German generals of the first group included [Otto] Renoldi, Schlömer, Deboi, and Von Daniels. All fought in the last war and are damn proud of it. We were whisked through the room and had little chance to question them, but when they heard were were American correspondents, Schlömer and Renoldi began long conversations about how they like cigarettes of the American type and had used up their ration of Russian cigarettes. Not a single reporter responded to their hint to give them a smoke. I believe if anyone had, he would have been tackled by the entire press corps when we got outside. These generals were getting a Red Army officer's rations according to the Hague Convention, which is too much considering the kind of rats they are. In the next room Von Drebber, who looks more like a college professor than a military man, dominated the group which included such nasty types as [Hans] Wulz, who is a small, bald-headed, potbellied Prussian who only managed to squeeze out an unenthusiastic "Heil." Von Drebber, six feet four inches tall, was asked what primary factors led to his defeat. He drew himself up and politely replied: "The Russians struck from the north and south—we were simply sitting in the middle. We were surrounded, cut off with no munitions and no food." We tried again asking why they didn't try to break out of encirclement. Von Drebber said: "At one time we could have broken the ring—but you will have to ask Marshal Paulus about questions of strategy." He was asked if he had Hitler's permission to surrender. Von Drebber said: "I was ordered by Paulus to hold until I pushed back to a certain line. When I reached that line I surrendered." Then we asked Wulz, who is an artillery general, how Russian artillery compared to German artillery. He made a whining, inconsequential answer that "every army has good and bad guns, good and bad artillery—that's how it is with the Russian and German armies." Schlömer, who was stationed in another house, said however: "The Red Army fought well everywhere we met them." But the most revealing statements came from Von Arnim and [Fritz] Roske. Roske was asked how the Russians broke them down. Von Arnim interrupted: "That question is badly put. You should ask how we managed to hold out under such conditions." Roske ignored Von Arnim's remark with a brief statement: "Hunger, cold, and lack of munitions." However, the Russian colonel was anxious to show us the Red Army's prize exhibit and rushed us to a small farmhouse sitting apart from the others. We gathered outside around the doorway while a grinning Mongolian soldier—definitely non-Aryan—looked down on us. The door opened and out came Paulus, poker-faced except for a tic which spasmodically twitched from eye to mouth on the right side of his face. He is 53 but looked 65, his face lined and yellowish—almost the same yellowish color of the frozen corpses of men he left lying in gutters in Stalingrad. Accompanying him was his personal aide, Colonel Adam, a flat-faced Teuton who looked like a slightly overweight ball of concentrated Nazism, and Paulus' chief of staff, General Schmidt, who looked like he'd be happier running a Berlin butcher shop. All men were dressed in fur caps pulled down over their ears against the subzero cold. Paulus answered only two questions, which he appeared to do with effort. He said his first name was Friedrich and that he is 53. The standing and gazing captured Nazis in those overheated peasant houses, as well as that bare peasant yard where Paulus was held, gave the same feeling one gets when looking in a snake pit at a zoo. But the obvious comparison that strikes when looking at German officers and German soldiers is that the officers are always well-clad while the soldiers are just the opposite. And standing there in that obscure peasant village, these much decorated gold-braided groups of Nazi bigwigs reminded you of a flock of sad-eyed peacocks standing with distaste in a hen run. 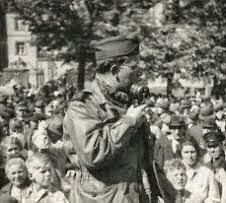 The conducting colonel loaded us into drafty buses for a 60 mile trip to Stalingrad. By nightfall the temperature dropped to 40 below, and we started out on a twelve hour, all night trip through snow to Stalingrad. We would have made the trip sooner when we ran into a Russian supply column moving westward from Stalingrad toward new battlefields. There was a long black line of soldiers, horses, mobile kitchens, guns, and cars. It was an unbelievable sight out there in the steppes to come upon so many people slowly moving along the snow-choked road. But the most unbelievable of all was the sight of camels pulling sledges in three feet of snow. As we made our way slowly along the road against traffic, a curious Red Army man came up to our bus, looked in, grinned and asked: "Deutschen Soldaten?" When we explained we were Americans he immediately called all his comrades and soon there was a great crowd around our bus. We passed out cigarettes and someone made a speech with the general theme of friendship between the Soviet Union and the United States. Russians will make a speech at the drop of the hat, but it gave you a warm feeling overcoming even the steppe temperatures to get such a demonstration of friendship at two o'clock in the morning in the swirling snow and wind 30 miles east of Stalingrad on the world's bloodiest battlefield. We arrived in Stalingrad at about 4 a.m. The driver seemed anxious to get there. We drove around for two hours. The only thing in sight were the dark ruins where we spotted fires which sentries cluttered around to keep warm. Our driver finally pulled up to one of these fires, and when he got out he was crying. Our interpreter explained that the driver had once lived in Stalingrad and had not been back to the city since the battle. "He can't find any street that he knows," the interpreter explained. "He hasn't yet recognized a house." This is because there were no houses. The streets were just auto tracks over ruins up and down through bombshell holes. This was the Red October factory district, parts of which changed hands a half dozen times during the fighting. As the sun came up the scene of devastation was so great it made a lump in your throat. This was the worker's factory district's small homes. These homes were absolutely flat. Not even a gracious blanket of snow could cover the destruction they suffered. Characteristic of all bombings I have seen in Britain, one of the most indestructible items of furniture in any home is the iron bedstead. It is the same in Stalingrad. The grave of every home is marked by charred headpieces of beds sticking up like tombstones over what was a peaceful home. Occasionally one could mark where a street once existed by looking closely at poles sticking six or seven feet out of the ground. These once were telephone poles which stuck ten to twelve feet up. Now they looked like blasted trees. Sentries told us that, believe it or not, some civilians holed up in their basements and stuck through the whole bombardment. These included some women who did washing and cooking for the Red Army. What these people suffered cannot even be imagined. When they were without food, they were forced to forage and risk bombshells. Horse meat was considered a delicacy, and sometimes bread. But they stuck through it, although many are not there to tell their story. At daybreak we were directed to the headquarters of the 62nd Army, which is credited for saving the city of Stalingrad. The headquarters is built into the side of a western bluff on the Volga near the bottom of a hundred foot high clay cliff. We were led up this cliff to dugouts—zemlyankas—small timber-roofed caves dug into the side of the cliff from where the Red Army held the Germans from establishing themselves on the bank of Russia's greatest river. Just three days earlier the Germans had been only 300 yards away from my zemlyanka. But I slept well—they are now fighting on a line 200 miles away. Rising above the Volga bluff is Stalingrad's famous Hill 102, Mamayev Kurgan, which the Germans held and placed heavy artillery. The hill commands a view of the entire city as well as the Volga, over which the Red Army's vital supply lines are held. The summit of Mamayev Kurgan is only about a quarter mile from the Volga, and between it and the river are the Red October and Red Barricades factories. Beyond these plants is the high Volga bank wherein zemlyankas are located. This is where some of the bitterest fighting occurred. We walked single file along a narrow path through the factory. There was little need to remind us the factory was mined, as every minute or so there was a shattering explosion of rock wreckage in a nearby district which Red Army sappers were de-mining. The Red October factory once made steel for tractors and farm implements. With the war it switched over to tank armaments. After the Battle of Stalingrad the whole plant is now simply a junk heap. The Germans took almost the entire building after it was mercilessly shelled and bombed flat. 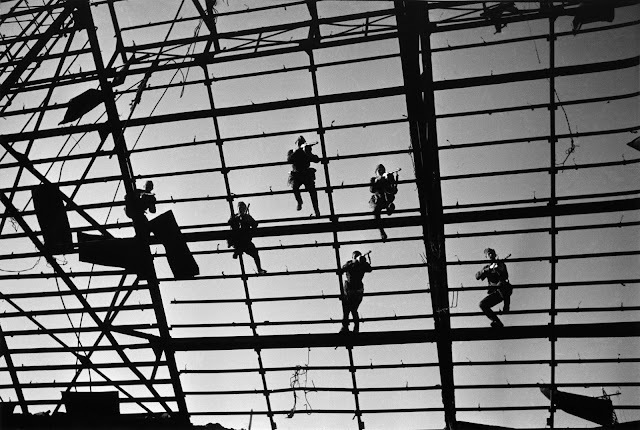 The only portions of the factory still standing are extremely heavy girders which once held cranes. All other buildings are flat. There literally was not a piece of sheet iron roofing or shovel or piece of metal sticking four inches above ground which didn't have bullet shrapnel or fragment holes through it. It was in this factory that we saw our first German dead. They were lying at the bottom of a large bomb crater with only their bare feet sticking up. Most of Red October's bodies had been cleaned up earlier. The de-mined path through the factory led across wreckage and craters. We passed a German dugout in perfectly good condition, clean and well-kept. Beside it stood a sentry, and a sign on the door warned: "Keep Away—This Booby Trap." The path ended at the most forward-line trenches the Germans held at the factory. These lines are on a small hill facing another factory building which still had two walls standing. The Russians held positions in the factory building which I paced, measuring twelve yards. It was here that some brilliant conversations between warring men occurred. This Russian factory position once manufactured consumer goods. Red Army men did their fighting here among dishpans, skillets, and shovels that littered the floor. The only ordinary looking battlefield we saw was Mamayev Kurgan. This hill is terraced in a series of five foot shelves, and there was a recently planted apple orchard with young saplings about four feet high. There is absolutely no cover, and looking down it from German gun positions are trenches. It appeared that a single squad of machine gunners could hold against advancing infantry forces indefinitely. Correspondents had trouble even walking over the slick snow uphill in broad daylight. It is hard to imagine what it must have been like for the Soviet soldiers who only a few weeks earlier negotiated slopes under a hail of bullets, artillery shrapnel, and dive bombers. The only statement on the subject I could get from a former Red Army man was a private who grimly admitted: "It was tough." But once they took positions atop the first ridge a really tough job still awaited. The Germans for weeks held two almost impregnable fortresses atop the hill. They were two circular water tanks about ten feet apart. The tanks were about 50 feet in diameter, dug 30 feet into the ground with about 15 feet of reinforced concrete surfaces sticking above ground. 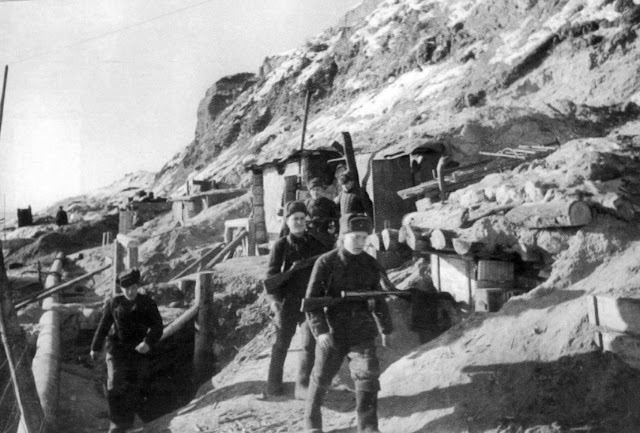 Around the tops these Germans threw earth embankment, forming a shell-proof, bomb-proof position virtually impregnable—until the Red Army decided to take it. The battlefield before these two fortresses was like any battlefield of the First World War. There were wrecked tanks, smashed Russian and German helmets, empty shell case remnants, and smashed guns. There were bodies which had not yet been cleaned up. There were pieces of mortars, bombs, grenades, and strips of machine gun bullets. The Russians finally took position by digging trenches up to the fortresses and then launching an infantry assault from there. Tanks were no good, only bayonets, grenades, and Tommy guns were effective in the final clean-out. But the greatest shock came when we entered the city of Stalingrad proper. The way Stalingrad is laid out is strip factory districts stretching northward along the Volga, with worker's districts connected by bus and streetcar lines. These settlements were marked by wreckage. Streetcars which ran between community centers now stood burned out, wrecked on what was left of their tracks. Store shops along Communist Street—which is the main highway connecting these settlements—now only had a few walls left. About every quarter mile on Communist Street the Germans built barricades eight feet high, consisting of two fences built five feet apart and filled in with dirt bricks and rubble from nearby houses. As we approached the city center with its modern buildings, there were more and more signs of increased fighting. Around the ground floor windows, many of which were sandbagged with apertures for machine guns, there were countless chinks made by bullets or holes made by shells. As we neared the town square called "Heroes of the Revolution" we could see bodies in doorways or behind barricades or lying on sidewalks. Fragments of letters and photographs from home, all written in German, littered streets—letters from Berlin and Hamburg starting out with "Mein Lieber Karl," or Heinrich or Heinz. There was not a single manhole in Stalingrad's streets with a cover. Germans and Russians not only used the city's basements, housetops, and alleys for battlegrounds, but the sewers as well. Snipers were known to crawl through sewers and come out behind German positions to create panic. You could almost arm a full division with equipment lying about Stalingrad's ruined streets. Grenades clutter gutters. Full machine gun belts lie across sidewalks, and mortars are a dime a dozen. 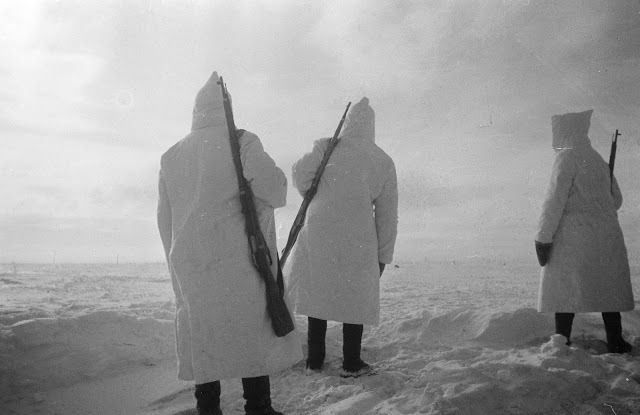 Veterans of the Stalingrad fight said it was not uncommon to find Russian and German soldiers locked in each other's death grip during the height of the fighting. That was the way these two armies locked in the city of Stalingrad fought until the Red Army proved itself more powerful and skilled and brought the Wehrmacht to its knees. Returning to my zemlyanka after this trip through Stalingrad, I went to the headquarters kitchen to ask for a drink of water. The Red Army girl dipped some out of a bucket with a tin cup. The water was cold and clean and good, and I told her so: "Your vodka and wine are great but nothing is better than this water." She threw back her head and replied: "It ought to be. It's Volga water. It's got Russian blood in it."